I think all gardeners must grow to hate rodents. In general I hold no ill will towards animals, but just don’t be a nuisance to my garden. I’ve even, in the past, naively, encouraged their habitation in my yard. My how I’ve changed. In the picture you see my 3 year old, Finn, and what was to be his flower. 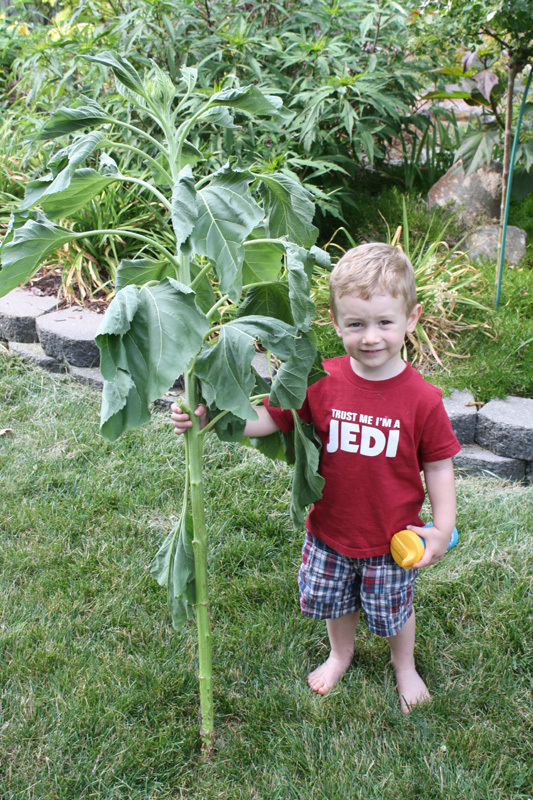 A mammoth sunflower, he planted it, and watered it, and watched it grow. Then, one day, an evil fat groundhog made it into my yard and tried climbing it and broke it off at the soil line. I had previously completely blocked off my yard with fencing and stone and cement blocks, this creature burrowed under my fence and under some cement blocks which, because of some quirk in that spot, didn’t fall down into the hole he made to block him, and he got into the yard. He is lucky the city frowns on shotgun pest control. The thing also got into my raised beds, which I also had fenced (which means he climbed a 4 foot fence) and ate carrot tops and kale. Meanwhile chipmunks steal my strawberries and grapes and dig and burrow, voles dig and burrow, and moles dig and burrow, all over my yard. Oh ya, and then, one of the above, or maybe a squirrel, keeps digging out the replacement sunflower seeds I keep planting. So I have a water feature that attracts wildlife, and I’ve been watering and letting my kids play in the sprinkler which means my yard is still alive when most of the soil around is dry and dead, so I can see why they come, but I don’t like it. I’ve really changed quite a bit from a few years ago, I’ve had just too much damage caused by rodents, to garden and house, to really care about them anymore. I know someone will comment complaining about habitat loss, I don’t really care. I grew up in the woods a mile from my mailbox on a dirt road and we never had ground hogs, did not have many squirrels or chipmunks, and I never saw signs of mole or vole activity. Now I live in the city and have copious amounts of all of these. I think the city has too many trees and not enough hunters. I completely agree. I live in the city and we have terrible problems with chipmunks and squirrels and moles. Thankfully no groundhogs…yet. I grew up in the country and while we had insects, we never dealt with squirrels or chipmunks stealing our harvest. They all seemed to stay in the woods where they belonged. I have to agree, I am an animal lover myself but when it comes to my garden…that’s off limits. We have problems over here in the UK with foxes and badgers they cause endless amounts of trouble and damage for me! The part of Texas where I live is naturally prairie, but of course we have planted trees every few feet so the squirrels are out of hand. I used to wake to the sound of them burrowing in the attic of my apartment building every morning. Not sure this is a reason to get one, but my parents’ terrier has completely rid them of moles. They still have plenty of lizards and the occasional garden snake (and the squirrels at the bird feeder), and the dog chases them all, but there are no more burrowing critters. If only you lived in the country, you (or someone else) could take a little .22 and take care of your rodent problem. I’ve done that before with the prairie dogs that dig holes that my friend’s horses fall into sometimes. As for the gardening, would you recommend digging a pit and lining it with cinder blocks to keep out rodents from all angles? Down here in South Texas, the story is the same just different critters. Rabbits, squirrels and rats, leaf cutter ants after the peach trees, and the whole of the bird kingdom devours fruit, flowers and leaves of many plants. We are learning as we go. We have been investing in bird netting a little at a time. I’ve set live traps for the squirrels, not so live traps for the rats. The rabbits are stopped by the 4 ft. rabbit fencing (so far). The ants are like something from a ’50s sci-fi movie. We try to follow them back to their nest entrances and put down a special poison. So far ants are in the lead. Our only time to enjoy our gardens is in the winter. Our temperate climate allows for us to have many vegies from November through March as the critters seem to take off. that’s evil!, we only battle with moles tearing up the lawn, but the cats help with that. You just ‘plant’ the bottles in the garden and leave enough of the glass neck exposed so it catches the wind and vibrates (think of how it is used as an instrument in a jug band) the noise and the vibration chase them away. We take care of our ant problem with Laundry soap ! of all walls. within days No more ants !! The soap will not hurt your crops.